Enterprise F.P.H.U. 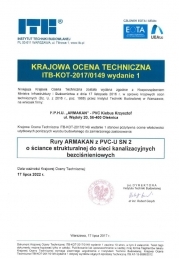 ( Firma Produkcyjno-Handlowo-Usługowa.- Production, Trade, and Service Company) ARMAKAN-PVC was founded in 1995 and it is a manufacturer of plumbing systems for the internal sewage in the range of diameters from 32 to 110 mm and of external sewage in the range of diameters from 110 to 200 mm. The products are manufactured from polypropylene (PP), polyvinyl chloride (PVC) and the entire production process conforms to the European quality and environmental standards. The company works mainly with proven construction warehouses, wholesalers, and partner companies throughout the whole country. Increasing revenue is generated in foreign markets. Sewer systems of ARMAKAN are recommended to investors installers, designers, who want to have a reliable and permanent installations. In order to achieve high standards of quality, to increase production capacity and improve the efficiency of production, ARMAKAN invests considerable resources in expansion and modernization of production lines. The effects of this are visible , inter alia, in dynamic income and increasing production indicators. A priority element of the company's policy is to counteract the harmful effects of impact of this type of production on the environment, and the organization of the production process in such a way that the maximum production efficiency is achieved at minimum harm to the environment. The objective of the company is to provide modern sewage systems, which are based on verified solutions that form the living standard and working environment for the customers. In accordance with the requirements of a competitive market in the Integrated Management System Policy, the objective of F.P.H.U. (Firma Produkcyjno-Handlowo-Usługowa - Production, Trade and Service Company) "ARMAKAN"-PVC is the continuous improvement of the products quality, i.e. pipes and fittings made of PVC and PP and provided to clients. supervision and monitoring of noise levels and minimizing their impact on a man.